Launched January 31, 2014, this no-load mutual fund seeks returns from both capital appreciation and dividend income. Managed by Mitch Zacks, it targets stocks that not only pay substantial dividends now but are predicted to do so in the future based on our analysis of the companies' earnings prospects. The case for dividend-paying stocks can be particularly compelling in today's low-yield, low-interest rate environment. Capturing yield via bonds is both risky and difficult. Adding quality, high-paying dividend stocks is one way to pursue capital appreciation with potentially less volatility in your portfolio. The impact of dividends on overall stock performance is demonstrated in the chart at right. 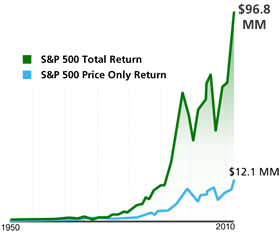 Since the 1930's dividends have contributed to nearly 40% of the S&P 500's total return. Zacks Investment Management was founded in 1992 as a wholly owned subsidiary of Zacks Investment Research, one of the largest, most trusted providers of independent equity data and recommendations. This "Think Tank" has served investors since Len Zacks' 1978 discovery that earnings estimate revisions are the most powerful force impacting stock prices. Mitch Zacks is the firm's primary expert on quantitative investing and is a noted author and columnist on that subject. He holds a B.A. from Yale and an M.B.A. from the University of Chicago. What Is the Process for Selecting Stocks? Start with the Russell 1000 Value Universe. Apply a value screen based on a proprietary model that includes dividend yield. Distill stocks with potential price appreciation. Maintain 50 to 100 positions. Review these stocks daily for developments that may affect future performance. The Zacks Dividend Fund (ZDIVX) is available to you through most brokerage firms including ZacksTrade, Charles Schwab, Fidelity, E*TRADE, Scottrade, and TD Ameritrade to name a few. An investment in the Fund is subject to risks, and you could lose money on your investment. There can be no assurance that the Fund will achieve their investment objectives. There is a risk that the value of the Fund's stocks may fall due to general market and economic conditions and perceptions regarding the industries and or companies in which the Fund is invested. This illustration represents $100,000 invested on January 1, 1950 through December 31, 2013. The light green line shows the growth of the investment assuming dividends were reinvested. The resulting value equals $96,780,224. The dark green line represents the value of the investment assuming all dividends were taken in cash and not reinvested. The same $100,000 investment results in an ending value of $12,125,930.